Heat oven to 375°F. If using dough sheet: Unroll dough; starting in center, press into 12x9-inch rectangle. If using crescent dough: Unroll dough into 1 large rectangle; press into 12x9-inch rectangle, firmly pressing perforations to seal. Cut dough into 12 squares. Gently press each square into ungreased mini muffin cup, shaping edges to form rim 1/4 inch above top of cup. With sharp knife, carefully remove rind from cheese. 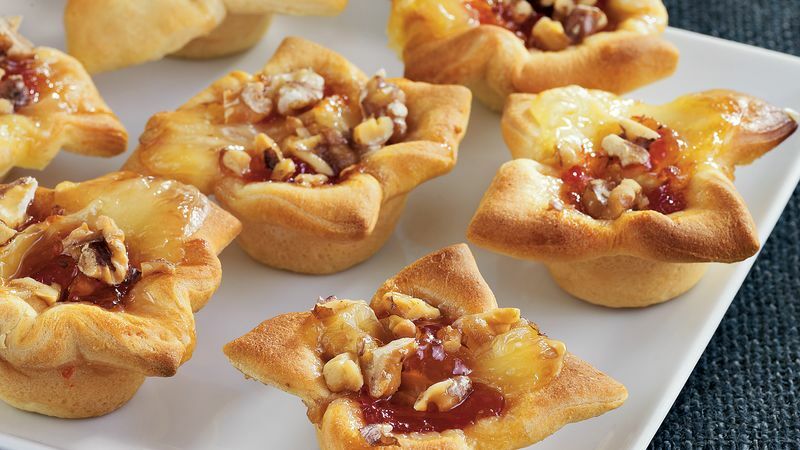 Cut cheese into 12 pieces; place in dough-lined cups. Spoon jelly evenly over cheese. Sprinkle with walnuts. Bake 15 to 20 minutes or until edges are golden brown. Cool 5 minutes. Remove from muffin cups. Serve warm. Other flavors that would work well in this recipe instead of red pepper jelly are strawberry jelly, raspberry jam or cranberry chutney.